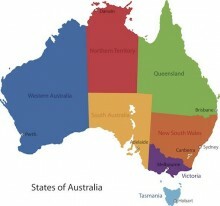 Australia is a country in the Southern hemisphere and belongs to Oceania. Australia/Oceania is the smallest continent of the seven continents and many consider it as the largest island in the world, however, Greenland is the biggest island country. Australia is an island continent surrounded by the Indian Ocean and the Pacific Ocean. Australia is the sixth largest country in the world, after Russia, Canada, USA, China and Brazil. The country is divided into six states (Southern Australia, Western Australia, New South Wales, Queensland, Victoria and Tasmania) and two self-governing territories: Northern Territory and Australian Capital Territory (which is around Canberra, the capital city). The main cities in Australia are: Sydney, Melbourne, Perth, Brisbane, Darwin, Adelaide, Hobart and Canberra (capital city). The cities are all located at the coast or close to the coast. The country's interior, which covers two thirds of the country, consist of desert landscape which is referred to as 'outback'. The main city in the country's interior is Alice Springs.